There was 7 in stock on 20 April 2019 at 11:40. Bridgestone say that Your favorite corner will look completely different . The S20 EVO that Bridgestone say was loved by so many riders has evolved again. Due to its superior agility, the S21’s ease of handling and the contact feel when cornering surpass even that of the S20 EVO. The rear tire was developed with Bridgestone’s technology, while the compound succeeds in generating better traction and while improving abrasion resistance for longer life. 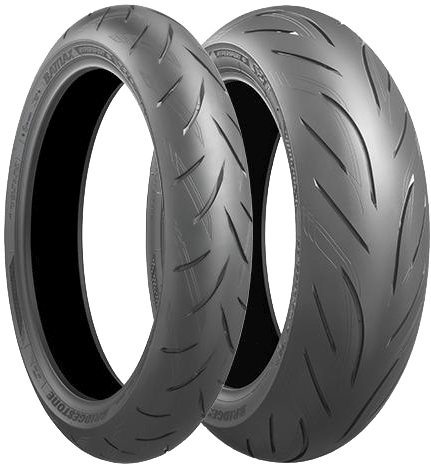 This Bridgestone think of as the birth of a new premium sports radial, one that brings out the best in machine performance in pursuit of the joy of riding. Riders who mostly enjoy sports riding. Riders of supersports motorcycles who want a combination of performance in the wet and long life. Riders who are thinking of starting riding on the racetrack.